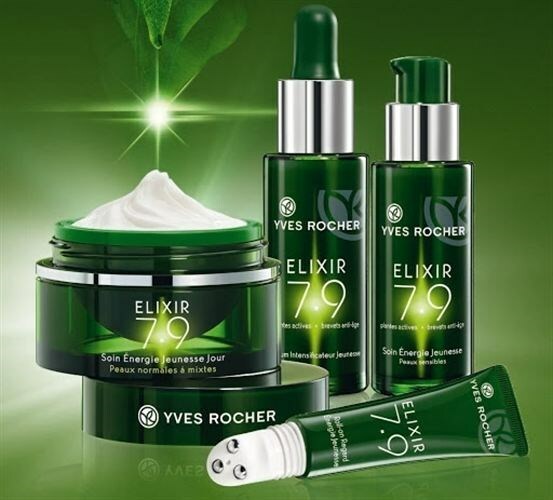 Reveal your skin's youthful energy with Yves Rocher Elixir 7.9! With a formula containing a combination of 7 plants with anti-aging power to boost skin's energy reserves and reactive its youth including: green rice inositol from Japan - to improve radiance and the overall look of the skin; santhorn seed extract from Asia - to improve volume, elasticity and density of the skin; aloe vera polyosides from Mexico - to strengthen the derm as well as strengthen and improve protection and hydration; tara seed extracts from Peru - to improve the skin's cohesion between the derm and the epidermis as well as fight against sagging skin; beet root extract from France - to protect against environmental stressors and dehydration as well as stimulate rehydration; aphloia extract from Madagascar - to protect against environmental stressors; and apple oligosides from France - to smooth wrinkles, boost radiance, refine skin texture and improve the global function of the skin. Youth Energy Day Care - Normal to Combination Skin - 40ml - $56 - with a cream gel texture that offers the comfort of a cream combined with the light freshness of a gel. Youth Energy Day Care - Dry Skin - 40ml - $56 - with a voluptuous, whipped cream texture that is enriched with shea butter for extra nourishment. Youth Energy Day Care - Sensitive Skin - 30ml - $56 - with a fragrance free, fluid texture that offers the comfort of a cream as it envelops skin in a veil of ultimate softness. Youth Energy Eye Care Roll-On - 15ml - $42 - with a gel texture that has an instant refreshing effect that revives the eye contour area upon application for eyes that are brighter, wrinkles smoothed and reduced under eye bags and dark circles. Youth Energy Night Care - 40ml - $56 - with a creamy balm texture that envelops skin in a soft cocoon - in just 1 night skin is re-energized, moisturized with revived radiance upon wakening. My faves are the Serum, which makes for a perfect layering product under my regular moisturizer for a concentrated dose of the anti-aging ingredients and the Eye Care Roll-On for its no-mess applicator and ability to reduce puffiness! I also really like, and the environmentally friendly amongst you will really appreciate that there are Eco-Refills available for the Day Care for Normal to Combination and Dry skin as well as the Night Care for $49 - just pop out the old pod and replace it with the new to save money and packaging - as well as the fact that for every Elixir 7.9 product purchased, a tree will be planted as part of the Yves Rocher Foundation's Plant for the Planet operation!